Before we begin, here’s a litte background on what bombay duck is. Contrary to what springs to mind, bombay duck is actually salty dried fish. The origin of the term “bombay duck” is uncertain. 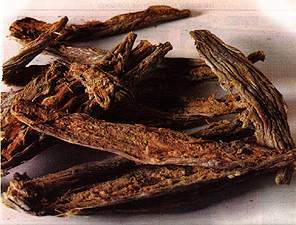 However, according to local Bangladeshi stories, the term was first used by British soldier Robert Clive, after tasting a piece of this dried fish during his conquest of Bengal. The story goes that he referenced the pungent smell to that of the newspapers and mail which would come in to the cantonments from Bombay. The term was later popularized amongst the British public by its appearance in Indian restaurants across the country. The pungent smell of the fish is actually considered a delicacy by most Bangladeshi’s and it can be cooked in a variety of ways. Alongside Bangladeshi’s, this salty dried fish is extremely popular in some Asian countries, in particular Indonesia. So if you have trouble finding it in a desi grocery store, hit an Asian store (Indonesian, Malaysian, Chinese) and they’ll be sure to have it. 1. Soak 6 pieces of bombay duck sticks in water and clean thoroughly. Drain when cleaned. 2. Cut the bombay duck into small pieces (about 4-5 pieces per stick). 3. Prepare the vegetables by cutting them into cubes. Dice the onion and garlic. 4. In hot oil, fry the diced garlic. When almost brown, add the diced onion and fry until almost brown. 5. Add the spices as above along with the salt. Note: Since the bombay duck is salty anyway, be cautious when adding salt to the bhuna/sauce. 6. Add half a cup of water and turn up the heat so the sauce gets thicker. Add chopped tomato and cook for 3-4 minutes. 7. Add the vegetable: if you are using potatoes, add them first before adding the shutki. Potatoes will take 10 minutes to cook, but if using the other vegetables mentioned, just cook for 5 minutes then add the shutki. 8. Cook for 10-15 minutes on low heat adding water as necessary to make the bhuna. Recommendations: Serve with hot white or brown basmati rice.